It's me! With short hair!! Wearing the Lourdes jacket from the shiny, new 'Ticket' pattern collection by Named Clothing. I was lucky enough to be a pattern tester for Named's latest collection, which meant that I received the jacket pattern free of charge. This blog post contains my own opinions on the pattern. I was sure that I would love this jacket so, after making a quick muslin, I unfolded this beautiful linen, bought recently from Potter's Textiles. I am so pleased that I chose the linen for this jacket as the denimy colour means that it goes with almost everything, so lots of chances to wear it. Also, I had only bought 1m of 150cm wide fabric and, with careful placing of the pattern pieces, that was just enough for the jacket. Perfection! The jacket has several lovely details: a round neckline, faux pockets set into the front darts (you could quite easily make these into real pockets), the lovely back pleat and the curved sleeve detailing, which Named calls a 'dolphin hem' on the cropped sleeves. It is also lined. I opted to use covered buttons as well for the first time ever. They were easy and fun to make and I like the look of them on this jacket. I wish now that I'd used blue thread instead of white for the buttonholes. 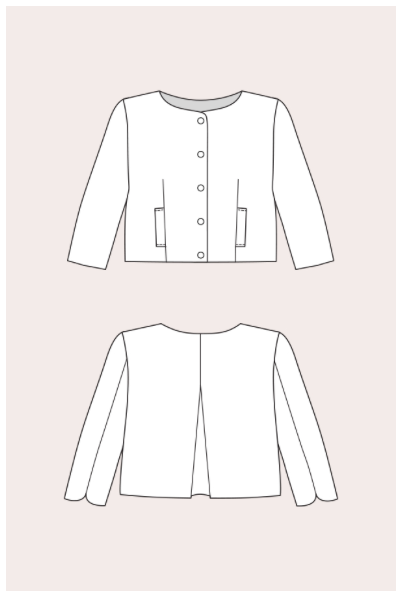 This is not a simple jacket to make and I love that the Ticket collection includes patterns for a range of sewing abilities. You can really get your teeth into this one and I learned some new techniques. The instructions for the jacket are comprehensive and include lots of little extras to give this a really lovely finish. The back pleat is cleverly stitched inside so that it holds its shape. The jacket even has narrow shoulder pads. Being a hoarder, I had saved some wide shoulder pads from the 80s and was able to just cut them down along the straight edge to fit. Note to self: smugly remind mother and sister of the reason I never throw anything away! Excuse me while I switch to some older photos and longer hair. The lining I used was cotton from the op shop. I made this pattern exactly according to the instructions with only one change. I often find jackets too tight across my upper back and this was the case with my muslin for this jacket. To give some extra room in that area I just added 1cm on each side of the middle back seam when cutting out. I don't know if this is the correct way, but it worked fine. Otherwise I think the Named size chart is spot on. Look at those cute little dolphins! I am really pleased with this jacket and I loved making it. Here are a few more pictures with a different outfit. What a great jacket. I live the sleeve detail and the pleat in the back. I would definitely wear this type of jacket. I am sure it will be a great addition to your autumn wardrobe. I meant to say love the sleeve detail! Also love the new haircut btw! I can imagine this looking great on you. Thank you for the haircut comment, it's so hard to get used to short hair! This is a really cute little jacket with lots of special details. I love the fabric you used. Like your new look too. Thank you. I love pattern testing! I love the new haircut! The jacket is lovely and you have certainly done justice to the pattern. I have some of this linen from Potters and hope mine looks as good as yours made up. Oh thank you. The linen is just beautiful. I'm so pleased this pattern came along or I probably would never have used it! Love the fabric what a versatile piece. I'm definitely planning on making this so excited to see your version. The details and cut are just perfect. Yes, it's a perfect jacket for a warm climate. I'll look forward to seeing yours! Thank you and thank you! I know, aren't they cute! What a great jacket; it's a lovely pattern with some nice detail. I like the back pleat and the dolphins! Cutting your hair much shorter is a big step but you look great. Look forward to more photos of the new you. I love cropped jackets and this one is particularly special. It looks fantastic over the cami and pants. I'm an avid reader of your blog - and this is lovely! I'm severely tempted to make this is a silk brocade but I'm wondering if it would be too stiff. Really!? I've been an avid reader of your blog for ages! I think this would be ok in a stiff fabric as long as it will be tamed into holding the back pleat. I hope you make it! WOW! I love everything about this jacket! I love Named too, and this is such a nice contemporary style, complimented perfectly by that utterly gorgeous linen. Now I want one just exactly like it! Lovely jacket - the whole outfit with the stripy dress, new haircut and sunnies is so chic! So lovely, just received this pattern today and you have spurred me on. This one is at the top of the pile now ;-) Beautiful linen too! I think the white buttonholes look nice. Lovely result!